Create animated Process Landscape diagrams yourself starting with a Trial Account here. Take a peek at the tutorials in the Dragon1 Step-by-Step Guide. Why do you start creating Process Landscape Diagrams? A Process Landscape Diagram, Process Diagram or Process Map is an architecture product that always should be present in your EA baseline, even if it is out of date. To have something is better than to have nothing because it always saves time and thus money searching for certain process/activity interdependencies. And of course, with a poster of the process landscape, you can do some effective process redesign and optimization. 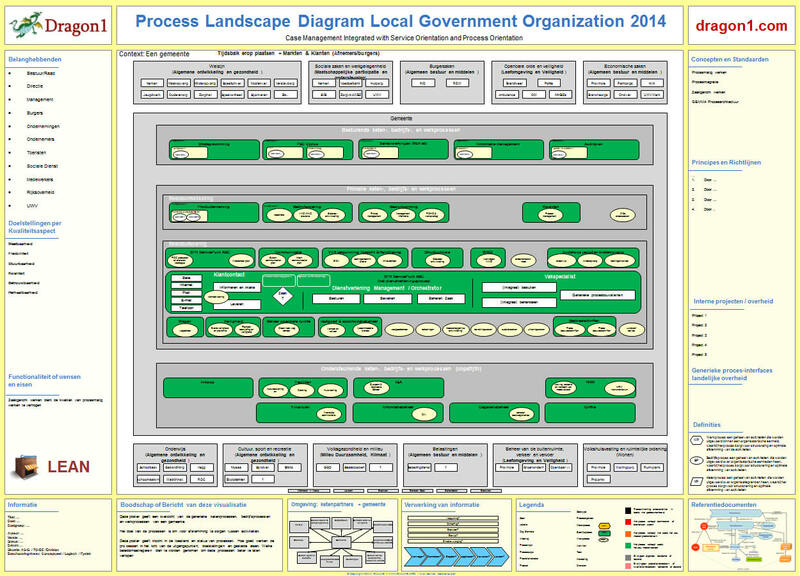 What is a Process Landscape Diagram? A process landscape itself is a coherent set of interconnected processes often within an enterprise, business or organization. A process landscape diagram or map is the visualization of a process landscape. A process landscape diagram shows the logical and physical structure, grouping, modularity, functionality and technology of business processes and working processes. Sometimes also together with the business functions, business services, capabilities and activities they are related with, where what business objects are handled, the information they communicate, the organizational departments, locations and environments they are in, but also the users and their roles who execute the processes. There is no sharp line to say what should or should not be on the overview poster. It is more a matter of what the viewer (stakeholder) is interested to see or look at. If you look at a garden landscape, some art and statues might be there, but you do not see them because you are not looking at them. You will accomplish a lot with process diagrams, depending on what information about the processes you provide. You should not focus on department names, working instructions or procedures. Instead, you should focus on the process ownership, process costs and business benefits. Do not worry if you have only 20 business processes or 2000 business processes. They always fit onto an A0 sized poster format. It depends on you how well it is done. This step by step guide helps you. Think twice before creating a process landscape diagram without an assignment (of the proper owner/client). Make an inventory of current problems with processes together with their users. Verify if processes to them are only the manual processes (labor/work) or maybe also the automated information system / application / infrastructure processes. Show an example Process landscape Diagram (see figure 3) to the owner/client (the COO) you want to get an assignment from. State the benefits of having a process map visualized, such as effective activity deduplication and rationalization, optimizing process output, managing complexity or less misunderstandings with employees. Get an assignment from the owner/client (COO) to create an AS-IS process map that afterwards really is used, managed and updated. Communicate you have been given the assignment to get sponsors and hands to help you. Decide on a taxonomy (the theoretical structure) or re-engineer the ontology (the practical structure) of your business processes: How are processes decomposed in your opinion or according to the industry reference architecture? Are processes groups of activities, services or functions? Are business functions groups of processes? Do business domains group processes across business systems? Do processes handle business objects? Etc..., Etc.. Yes or No? Define the sorts and types of entities: Do we differentiate between chain processes, business processes and work processes? Do we decompose processes into steps into activities into tasks into acts? Are they magnitudes of work? What is the workplace exactly? Create a process meta-model (what entity classes are you going to use on the poster? Using a modeling language and the taxonomy or ontology in the step before. You could also create an enterprise meta-model to relate your processes to products, processes and application and hardware devices. But focus on processes is important now. Write down the business rules that should apply: such as: Every business processes is supported by not more than one core information system. Or: All financial activities should be in financial processes. Startup a background collection process for the inventory of all current business rules and process architecture principles. Be sure to define every term you use on the process landscape. Make interview rounds with users and administrators of processes. 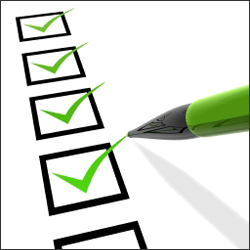 Collect information about your processes in an excel sheet or in an EA tool repository. Sometimes you can export data from a cmdb tool to start with. When collecting information about processes, at least use the following attributes: unique identifier, calling name, functional name, version, list of activities, list of business objects handled, list of interfaces and information, process cost, input, output, performance indicators, roles, list of process decisions, age. Collect status information about the processes: do the comply to standard, criteria, business rules and process architecture principles? Make the context and scope clear on the visualization via the set of data you show. Include data of the organization and its business units in the view, resulting in a picture in the background to project the landscape on. Is the landscape created because of rationalization purposes or some other reason? Are we showing the whole company or just a business unit? If you regard processes as service provider for groups of functionality, you should model and draw these. If you want to use the process landscape map to standardize on types of interfaces or to improve working with a single source of truth, you will have to model and draw types interfaces and what source data is stored and handled where. It is a best practice to collect more information (in detail and attributes) than you will show. This enables you for instance to report consolidated data and verify data. If you are making the process landscape poster for the CFO, be sure to include financial data, if you are making the process landscape poster for the COO be sure to include technology data, if you are making the process landscape poster for the COO be sure to include processes and business continuity information. Your process map should be in a version with and without issues and indicators. The one with, is used for strategic decision making. The clean one is used for showing off. Draw a business domain view (see figure 2) of your process landscape. Link owners, managers, users and process analysts to the business domains. 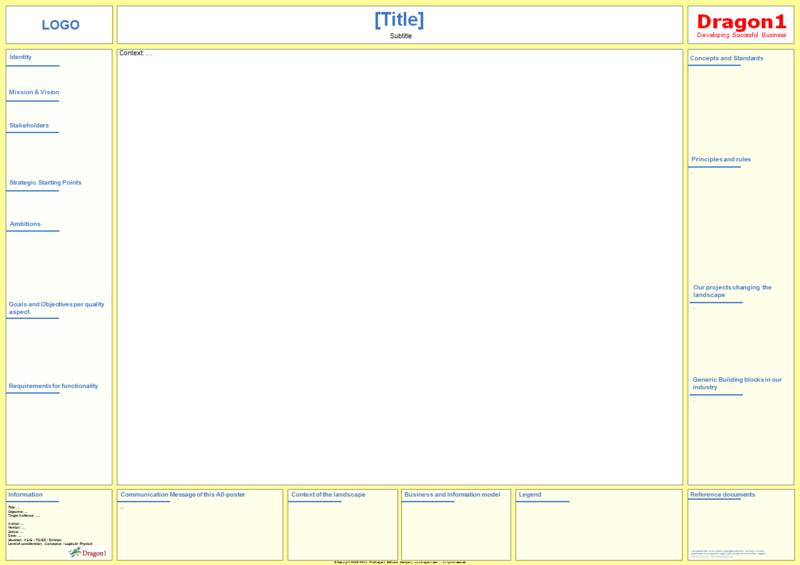 Define and write down the scope and context of the domains, how they are or should be managed. You work mainly with business domains to decomplex the process landscape. Write down carefully on how these business domains interact. How dependent are they to each other? 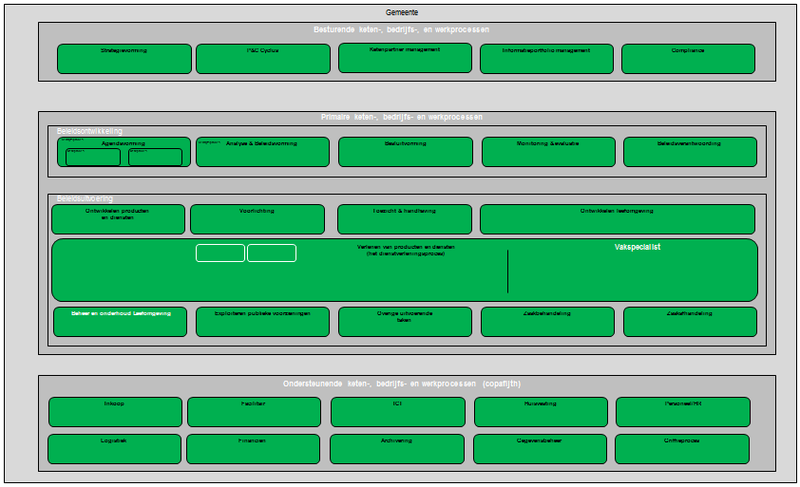 Choose an optical overall pattern layout for your process landscape and a pattern layout per domain or business system. Example patterns are layers, bars, u-shapes, circles, random groups or chaotic distribution. With a pattern, you immediately tell something. Just compare it with a landscape map of a city. That tells you if things are organized or not and what solutions are workable when solving certain problems. This goes also for your process map. You can have a business domain with supporting activities point to point related to one core activity. And in other domains, you may work with a service-oriented process. Make sure that you have different symbol/color combinations for different types of primary and supporting business and work processes. If you draw a garden you do not draw all the plants and trees in the same shape! Always use a color scheme and font scheme and be sure to check out the company policy on logos, presentations and fonts and colors. Know that objects that are placed close to each other will seem to belong to each other. Work with repetition, rhythm and proportionality to create the desired optical effects. In Dragon1 we use a solid line to indicate currently an entity is there, a dotted line to indicate an entity was there, a dashed line to indicate an entity will be there in the future. A successful process landscape poster contains a lot of information the owner/client knows and likes to see and does not know and does not like to see (because of the situation), making him take action immediately. Have post-its ready when presenting the landscape. And have two versions printed: one with and one without indicators, alerts and issues. Take the Architecture View Layout of Dragon1 (see figure 1). Write down policy for using, administration (updating) and management of the process landscape. Update the process landscape at least once every 3 months. A lot of roles in the organization (COO, CFO, CIO, administrator, supplier, manager, architect) have much quicker access to information to make decisions on. A visualization of a process is much more objective and easier to understand (harder to misunderstand) than a textual version. The impact of change can be visualized on the drawing table before you do it in practice. Showstoppers can be eliminated. You as architect show how well it works to visualize the whole of a complex system and then manage with it, instead of working with textual documents with partial inconsistent drawings. You as architect give ideas to others what also could be visualized. If you use a tool to create a landscape poster, you can try different scenarios to solve problems. When you have your process landscape map you can use color and lines, for instance, to indicate where and what processes are not compliant to the company standards and principles, or what optimization of activities goes wrong or what business objects cannot be handled correctly because of a certain situation. You can also gray-out the process map and only colorize the items in scope for a certain project or situation. 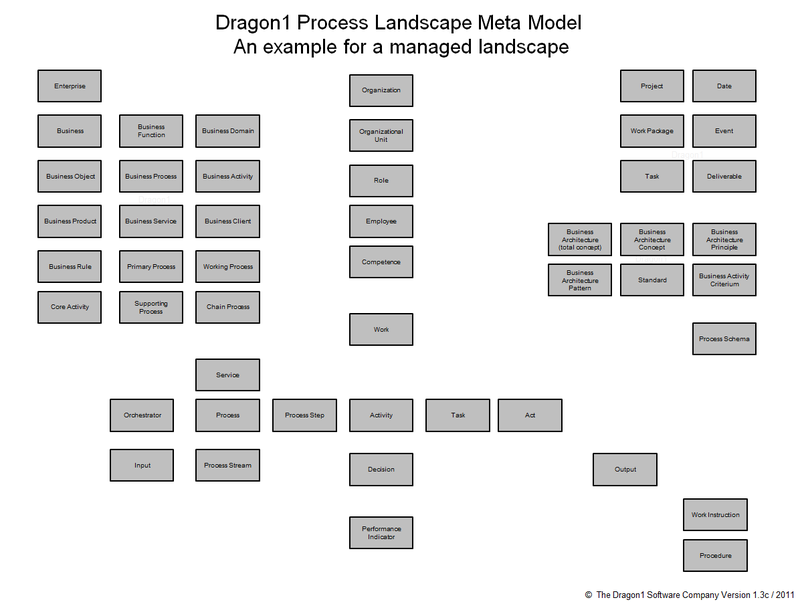 Of course, this is all much easier to do with a specialist tool like Dragon1 as BPM Tool than with a generic tool or basic BPM Tool like PowerPoint, Visio or Archi (Open Source). Everything in the process landscape needs to be uniquely identifiable. But it is important to work with a pure (meaningless) key, such as #PART0001 to #PART9999. We hope we have inspired you to start creating landscape diagrams. If you do not have the time and you need a Process Landscape on short notice, we can create a Landscape for you.